I took a long break from ORMs in my career: about 4 years. I was working on a reporting product, and an ORM is just the wrong tool for that. Before that, I worked with ORMs here and there: NHibernate and another ORM I don't even want to mention by name for fear of being associated with it in public. For some of my own projects like the next version of EZRep and this very blog site, I've switched to a so-called micro-ORM, specifically Dapper. Now that I'm back to consulting, I'm back into the ORM game. This time, it's Entity Framework. Early in this project (that uses EF), I've been experiencing quite a bit of frustration. It seems like I'm swimming upstream while jumping through hoops to accomplish really simple things that wouldn't take nearly as much work in Dapper. Maybe this is just me getting back into the habit, but it's also got me thinking: why do I really need a "full" ORM anymore? Abstraction and indirection are important tools, but perhaps full ORMs aren't the least leaky abstraction anymore in many cases? Yes, a full ORM is sometimes RTRJ. 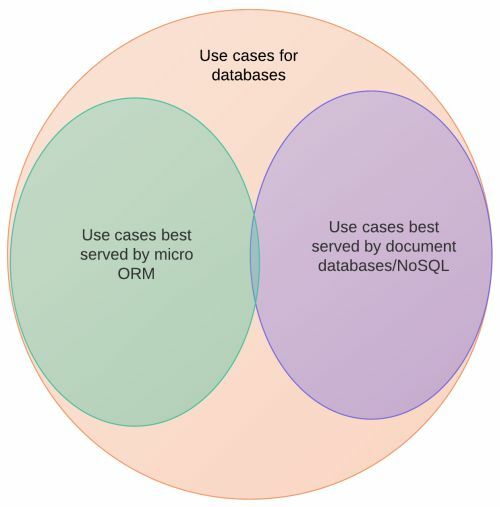 However, I think micro ORMs (Dapper, PetaPoco, Massive) and document databases (Raven, Couch, Mongo) have taken a big bite out of the pool of possible use cases, and that a lot of full ORM and/or RDBMS usage in projects is really used not because it's the best tool, but because of the sheer momentum of the status quo. Imagine a snapshot of a Venn diagram taken 5 or 10 years ago compared to one I made up to represent a snapshot of today. There might be missing bubbles like "RDBMS + no ORM" or "Json string in text file", and the exact proportions are open to interpretation. But the point I'm trying to make is this: the number of use cases that are best served by RDBMS + full ORM is shrinking, and will continue to shrink.